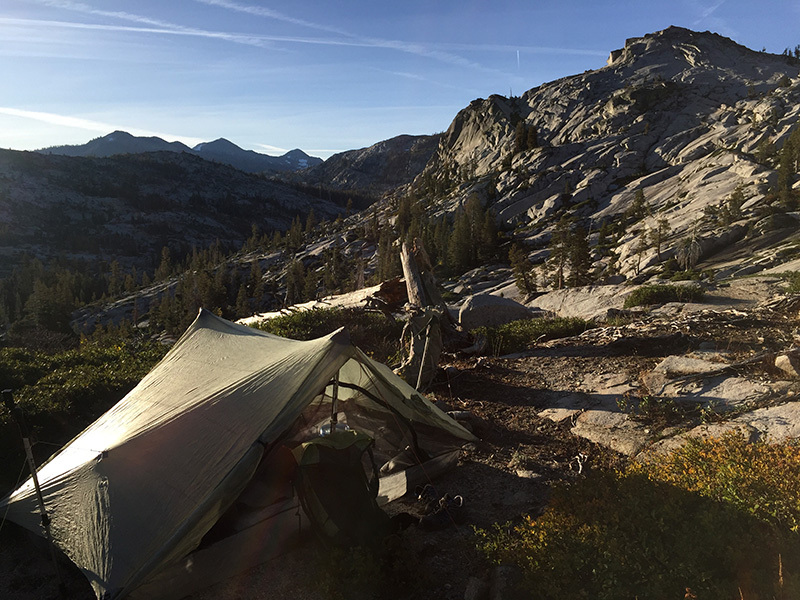 Desolation Wilderness is one of the most heavily used wilderness areas in the country. 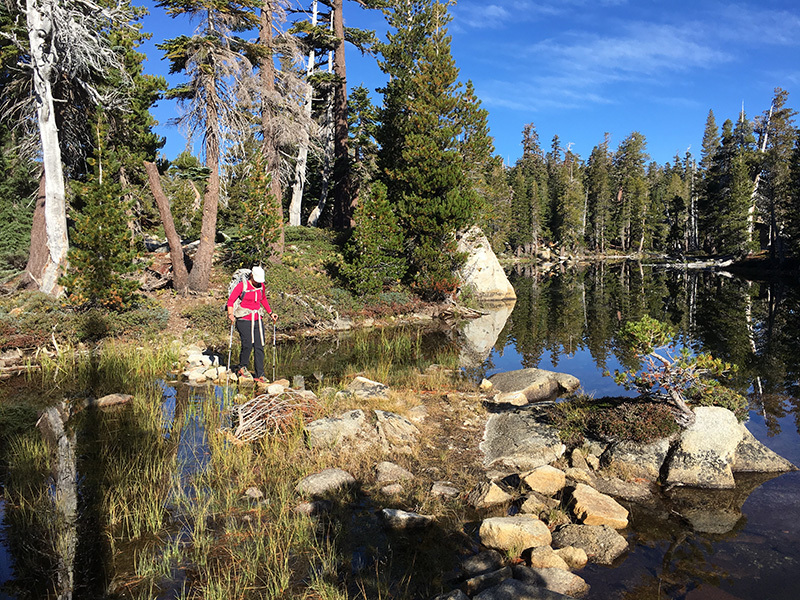 It can be difficult to find solitude, especially if you’re hiking to Lake Aloha or up Pyramid Peak on a summer weekend. The hike over Rockbound Pass is far less crowded than many of the trails on the eastern side of the wilderness. 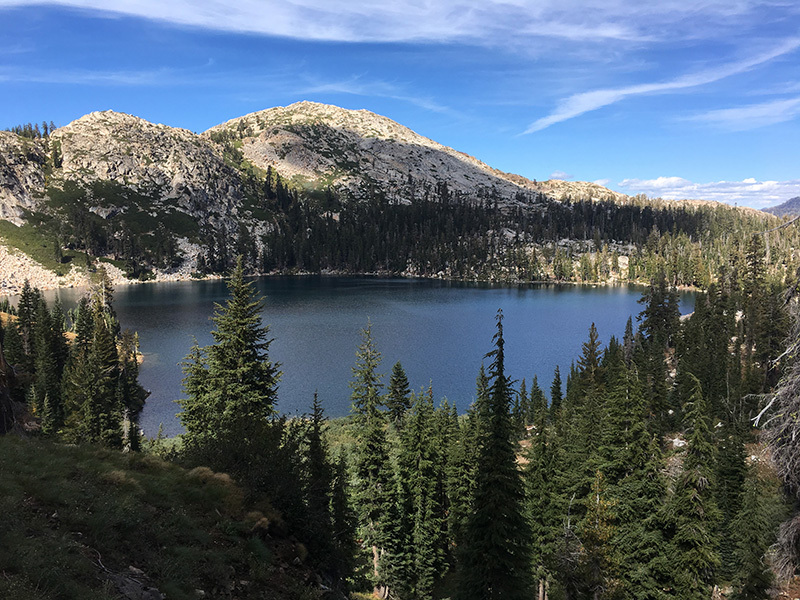 This 24-mile loop offers some of Desolation’s best scenery with numerous alpine lakes and stunning views of the Crystal Range. Red Tape: Permits are required. Day hikers can self-issue permits at the trailhead. For overnight permits, visit Recreation.gov and reserve in Zone 10 (for the halfway point) or Zones 25, 26, 21, 14, 11 or 22. Quotas apply in the summer. 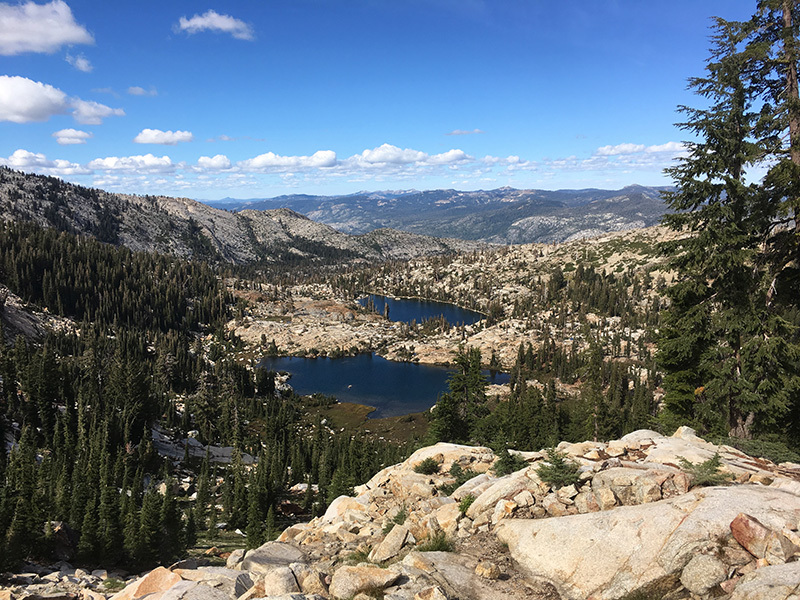 Parking at the trailhead is free, but check with the USFS to make sure Wrights Lake Road is open for the season. 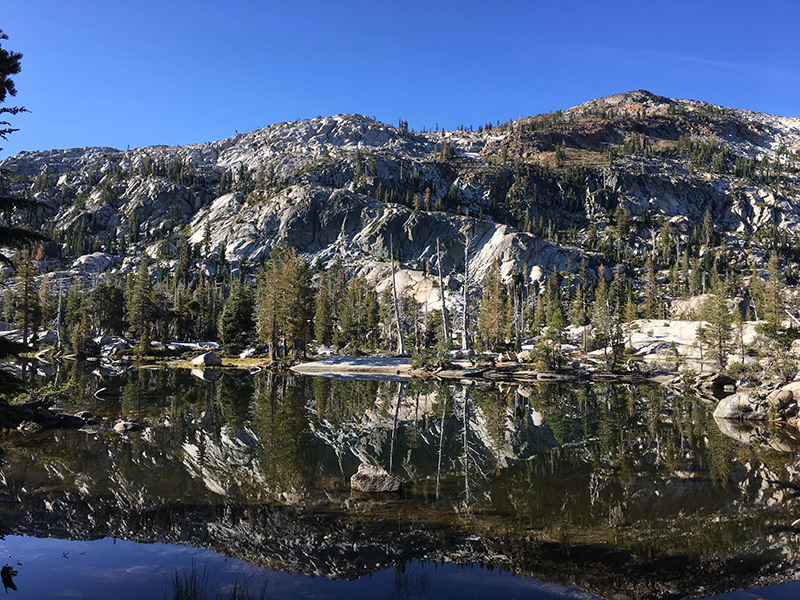 From Highway 50, turn north on to Wrights Lake Road (approximately 5 miles east of Kyburz). 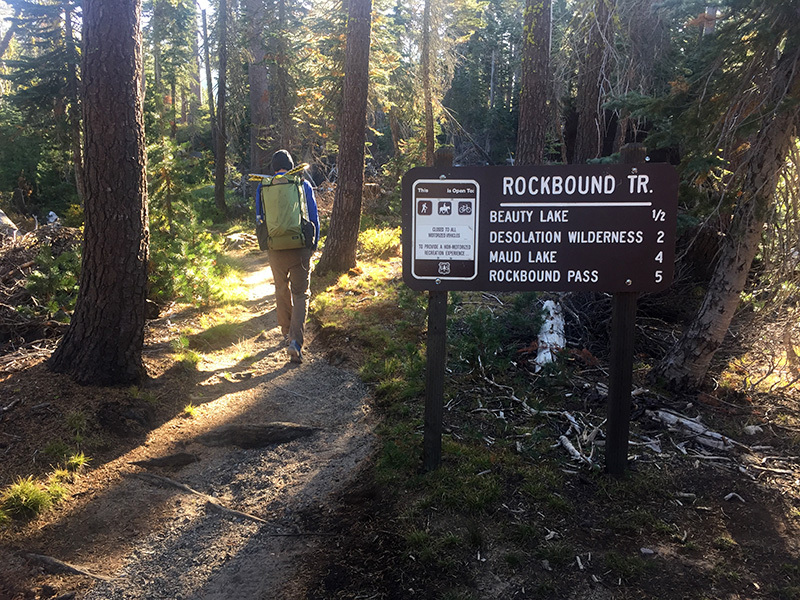 Follow the road 8 miles to the Wrights Lake Campground, then follow signs for the Rockbound trail. Google Map link to trailhead. Weekends are always too short, but after finishing some projects around the house, we both felt like spending our entire weekend outside, away from the house. I wanted to cram as much trail as possible in to our two whole days off from work and I had heard good things about Rockbound Pass. With good weather in the forecast, I reserved permits and planned out a 20+ mile loop. Saturday morning came and we were out the door around 7. We made it to the trailhead by 9, and soon we were on our way up the pass. The trail actually stays flat for a few miles before gaining any significant elevation. 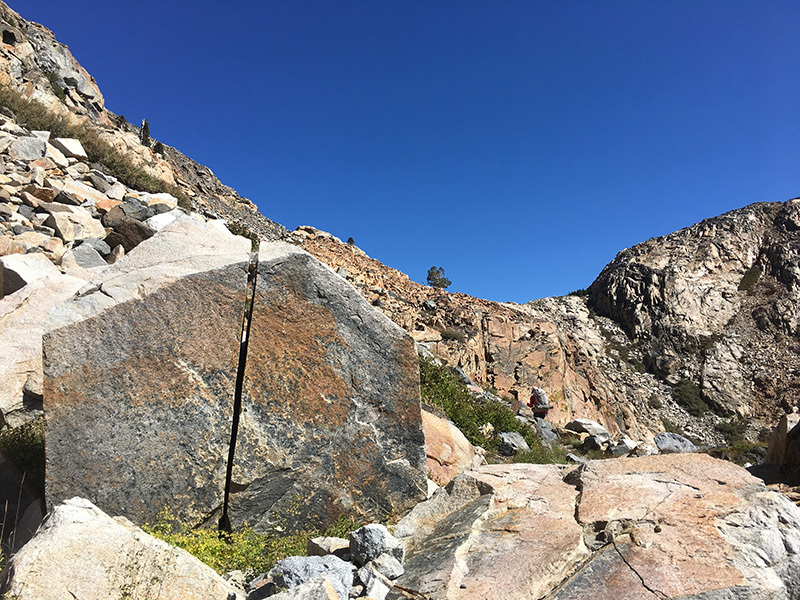 We passed Beauty Lake (probably the least beautiful lake on this trail) and soon we were hiking on wide open slabs of granite, following little rock cairns to stay on the correct path. We passed Maude Lake and spotted a few people camped on the lake’s shore. As we neared Rockbound Pass, it didn’t look like the trail continued up. The trail is rocky, and it’s well camouflaged in its rocky surroundings. Rockbound Pass in the distance. Nearing the top of Rockbound Pass. It was windy when we reached the top. We just kept going. 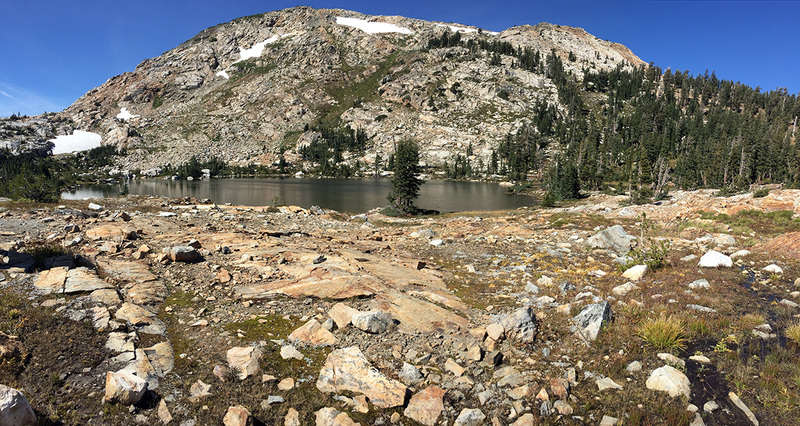 We passed Lake Doris and Lake Lois – both beautiful alpine lakes. About 8 miles in, we reached Lake Schmidell and took our first real break. I wasn’t terribly hungry, but I consumed a large amount of Starbursts and a granola bar. From Lake Schmidell, the trail becomes a little more challenging. This section is considered impassible for stock. It’s much steeper and difficult to follow, even with a map in hand. We climbed the steep grade to Leland Lakes. From there, the trail leveled off, but we still had to concentrate in order to stay on the right path. We passed McConnell Lake and Horseshoe Lake. Somewhere after Horseshoe Lake I started to get lightheaded. Perhaps candy wasn’t the best lunch choice. 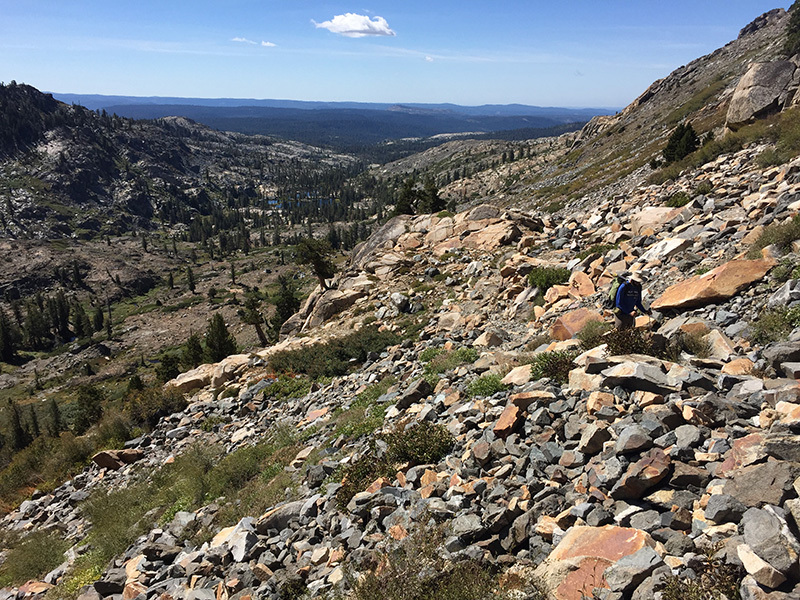 We were descending a vast granitic slope below Horseshoe Lake when I spotted a flat tent site. I suggested we camp. Rob agreed and we set up our tent. When I left to go find water, I realized we were basically camped on the trail. The trail really isn’t obvious in this section, and we hadn’t seen anyone all afternoon (nor would we until late the following day), so we didn’t bother finding a new site. The moon was bright and the temperatures dropped into the 30’s. Rob spotted a mouse dashing past our tent, but otherwise, all was quiet. We slept nearly 12 hours. After a breakfast of coffee and cereal, we packed up and finished our descent into the canyon. Upon reaching the bottom, we hiked upstream to the 4-Q’s Lakes. 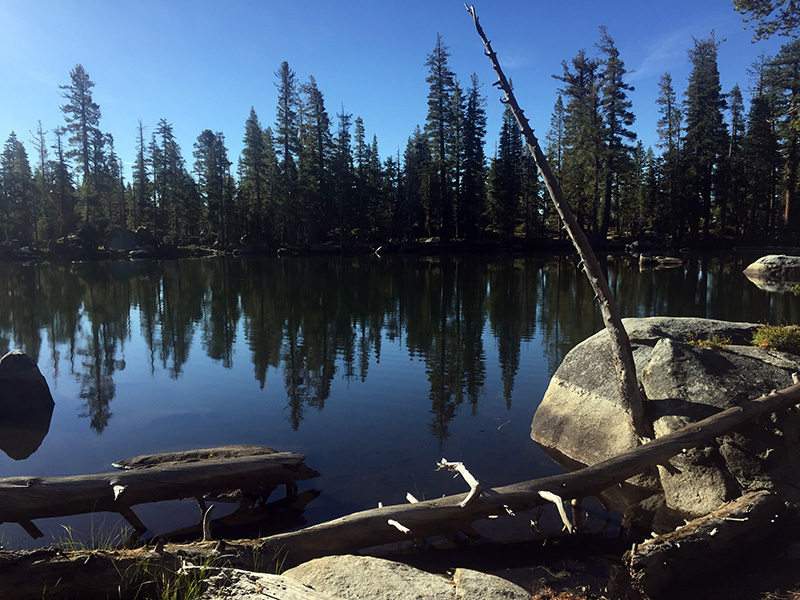 The trail meanders between these lakes before heading east toward Camper Flat and the Rubicon River. Somewhere around Camper Flat, we once again picked up a more developed trail. One of the 4-Q’s Lakes. The trail actually crosses through one of the lakes. As soon as we were back on a main trail, we stopped focusing on navigation and picked up our pace. We followed the Rubicon River for a couple of miles. Somewhere before China Flat, we turned right on a trail that took us back up to Lake Doris and Rockbound Pass. 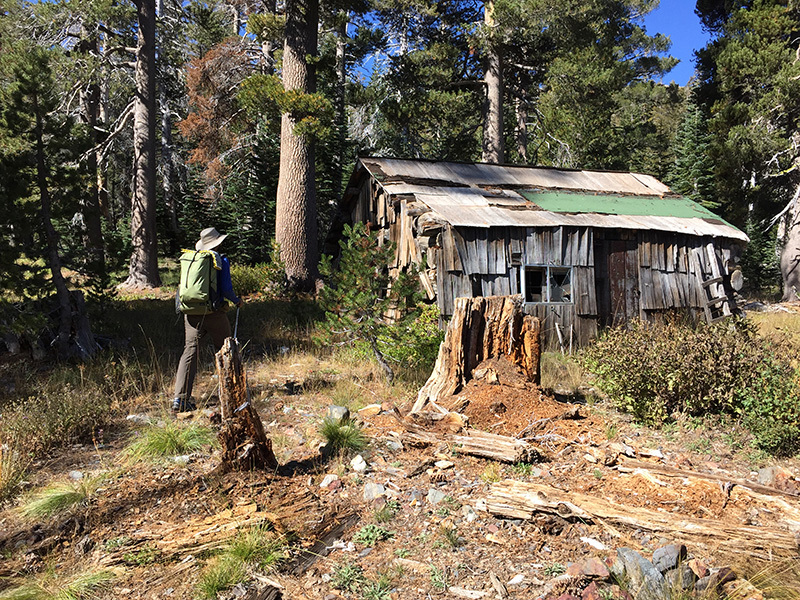 We discovered this old, abandonned cabin near China Flat. The descent from Rockbound Pass went quickly, but the last few miles felt very long. The drive home through Apple Hill traffic felt even longer. Despite our tiredness and the horrible traffic, spending the weekend outside was well worth it. Hi there! Thanks for the info and the pictures. I am planning on backpacking this loop in September. I am relatively new to backpacking, and my main concern is navigation. Do you have any tips for making sure we stay on the correct trail/ how do we know the correct trail? Hi! The Rockbound Pass trail is easy to follow. 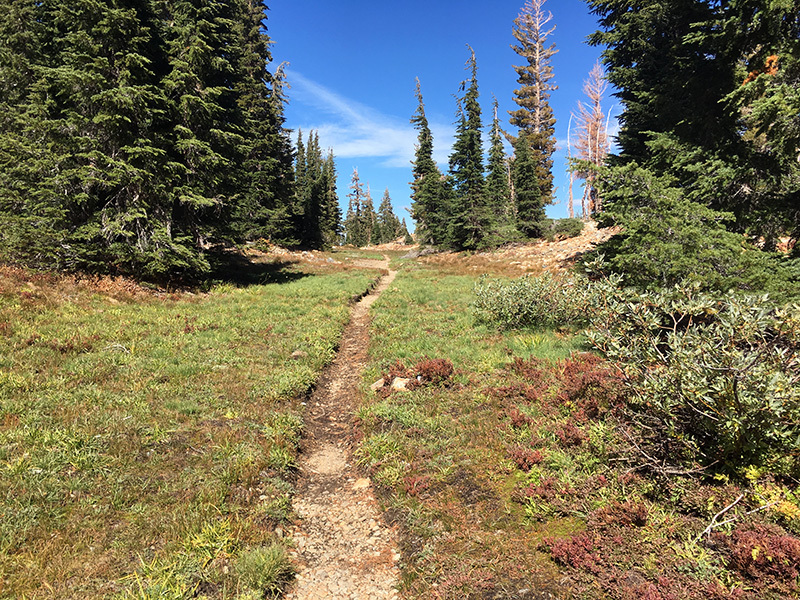 The trail gets a little faint and less maintained in a few spots past Lake Schmidell, but if you walk in the right direction, it always picks up again. The terrain is open and it’s relatively easy recognize features on the map. All the junctions are well signed, even on the lesser used trails. 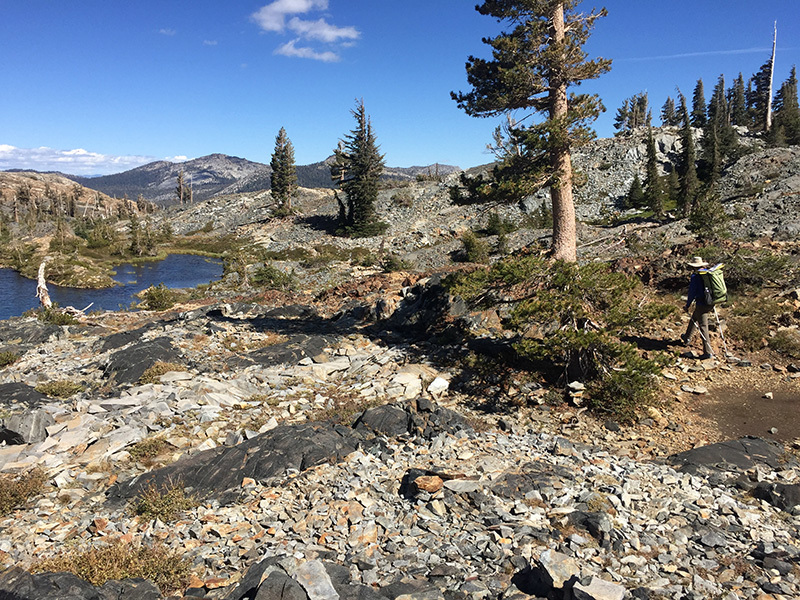 I would recommend bringing Tom Harrison’s map of Desolation Wilderness. Have a wonderful trip! Thanks for your response! I will definitely plan on bringing Tom Harrison’s map for our trip. Your website is great! I have lived in Sac for about a year now, and I am looking forward to do doing some exploring in Tahoe, Yosemite, and other parts of the Sierras. Your website is one of the few I have found that is informative and concise, so thank you! 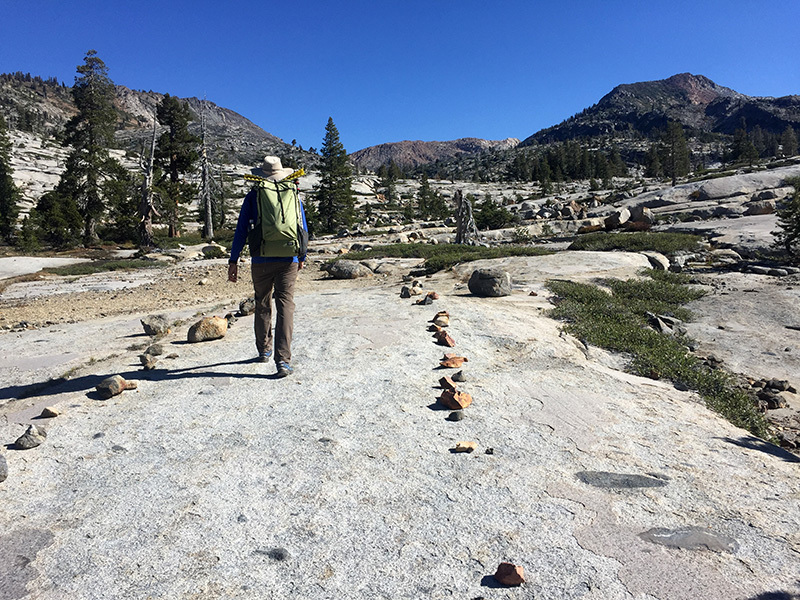 The trail is really easy to stay on save for a few slabs on granite- make sure you’re looking for cairns. Rockbound pass is a doozy- so if you’re new to hiking make sure you give yourself plenty of time to get to the top. I would recommend hiking poles.